Heat oven to 350°F. Grease rectangular baking dish, 13x9x2 inches. Layer sausage, mushrooms, onions, tomatoes and cheese in dish. Chorizo or hot Italian sausage can be substituted. For a deeper, rounder flavor, sauté the mushrooms in a little of the sausage fat until they release most of their liquid. Layer into the casserole with the sausage, onions, tomatoes, and cheese. Use a wire whisk to mix up the Bisquick™, milk, salt, oregano, pepper, and eggs until well blended. A 13x9-inch baking dish holds the same amount as a 3-quart casserole dish, so pull out a pretty pan if you’d like to serve guests. If you need to feed a crowd for breakfast, there is no better choice than a simple egg bake. This recipe’s classic ingredient list makes it a guaranteed hit. 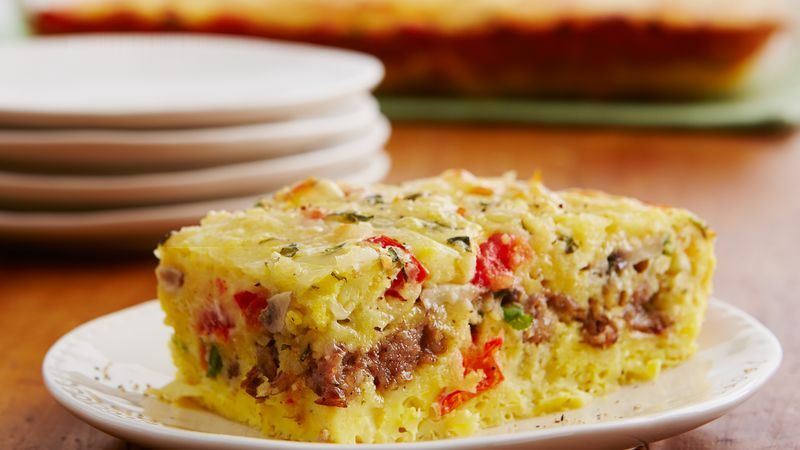 A hearty mixture of eggs, milk and Bisquick together with chunks of sausage, slices of savory mushrooms and bright bites of green onions makes this egg bake cheesy and hard to resist. If sausage and mushrooms aren’t your thing, check out the rest of Betty’s egg bake recipes. Wake up, put the coffee on, pop your bake in the oven and get ready for the best brunch of your life. You’ll find everything you need for a perfect meal right in one egg casserole dish—including sausage, mushrooms, onions, cheese and eggs. In the one hour it takes the casserole to bake, you can set the table, make a fruit salad, or just put your feet up and enjoy the delicious aromas filling your kitchen. If you want to walk through the basic steps for a make-ahead breakfast bake, Betty has all the answers in this handy guide to making an egg bake (with photos!). Once you’ve mastered this dish, check out even more Quiche and Egg Recipes where you’ll find traditional favorites, quick-and-easy shortcuts and fun new twists on old favorites.